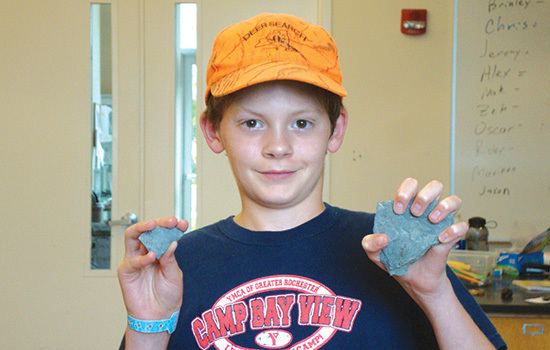 The 12-year-old held 350 million years of history in the palm of his hand. 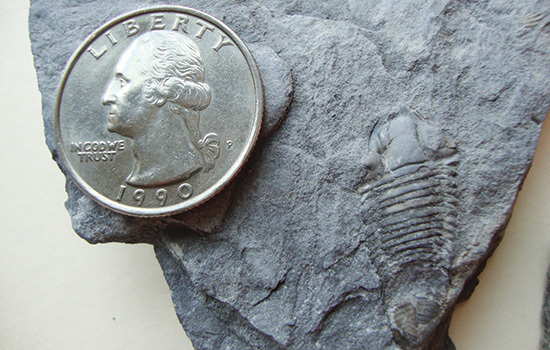 While chipping away at large rocks in Little Beard’s Creek in Livingston County, Nate Yax dislodged a trilobite, an ancient sea creature that lived before dinosaurs roamed the Earth. discovery camps annually. This year’s discovery was the kind that makes kids like Nate, who love foraging for fossils, end up really “digging” science. A dipleura dekayi trilobite looks like a cross between a horseshoe crab and a centipede. It is from the Middle Devonian Period, a time millions of years ago when Earth was predominantly water. “It was like a sea potato-bug,” says Nate, laughing. While not the first trilobite ever found, Nate’s was one of the smaller ones discovered in the area. It was fully intact, with no broken or missing parts. It was also a complete set, consisting of the fossil and its “counterpart,” the rock with the fossil’s impression, says John Handley, a fellow of the Rochester Academy of Science and a research associate with the Paleontological Research Institution in Ithaca. He and Logan Newman, the camp instructor, a biology teacher at East High School, led the campers on the dig this past summer. Nate donated the fossil to the Museum of the Earth, part of the Paleontological Research Institution. The museum houses one of the largest fossil collections in the United States. New York has significant rock formations with some old rocks exposed, close to the surface. Many of those layers are fossil-bearing, particularly from the Devonian and Silurian geological formations of more than 300 million years ago, with findings renown throughout the world, says Handley. It was not surprising to him that Nate tapped into a rock and unearthed a tiny bit of history.